Debates about gun control rage on after mass shootings seem to rock the country every few weeks. Depending on the narratives you accept this is either because people do not have guns to protect themselves or because guns are too easily accessible. But which side is right? Both seem to want a more peaceful world, but have different ways of achieving this. This piece will look into the statistics, hopefully finding some bit of evidence to make a decision one way or the other. I personally believe that gun rights are fairly ridiculous, but then again I’ve probably fired like one gun in my life and am almost a complete pacifist, so the idea of using and owning a gun is so far out of my worldview that I acknowledge this as a bias. I have never grown up in any sort of gun culture, so a lot of that is mystifying to me. Nonetheless, I am willing to take into consideration arguments that make the case that more gun ownership will make America a safer place. First we must throw two arguments for pro-gun ownership out the window. The first is any argument that guns should be owned because they are fun or you like to collect them. If you want to keep your guns just for funsies, I’m sorry but that’s a sacrifice you are going to have to make (if indeed stricter guns will make things safer). The second argument is the one which states ‘guns don’t kill people, people kill people’. Yes, that’s true, thank you for the logic. Anybody can kill anybody with just about anything. This is the reason why people’s hands aren’t made illegal, though they can kill people. Yet, what kills someone quicker, hands or a knife? A knife right? What kills someone quicker a knife or a gun? A gun right? A gun is specifically designed to kill or harm someone or something, as far as I know it has no other purpose. Knives, hammers, and baseball bats all have other purposes. The gun kills people easily and quickly. If someone pulls a knife out on a group of people, it is far easier to rush and stop him than it is someone with a gun. If we’re going to use the aforementioned logic, then we’re allowed to use the latter as well. There has been 7 mass stabbings (8% of mass killings) over the last 110 years, while there has been something like 62 mass shootings in the last 30 years (somewhere near 29 since Columbine), 15 of 25 of America’s largest mass shootings have come Columbine and beyond. People with guns kill people more than people without. It’s just easier to do and harder to stop. As a side note I must say that I do appreciate the emphasis on taking care of people’s mental health and agree that this is probably one of the keys to preventing violence from happening, but how do we do this? Surely those whose mental health affects them most are the ones most likely to not be receiving it (I would love data on this in either direction). According to this article taken from this study done by the U.S. Substance Abuse and Mental Health Services Administration, 50% of people suffering from mental health problems cannot afford coverage. If only there was some sort of affordable health care to cover it right? I jest, but really what are the other suggestions out there? (Note: I really would like to know the other options for taking care of the mentally ill). Now that those two arguments have been discussed, let’s move on to the larger question and to me the only competent argument, that if guns are taken away the only ones who will have them will be the “bad guys” and others will not be able to protect themselves. I can buy into the argument that guns will likely be purchased no matter what by those who truly desire them, legal or not (kind of like abortions, ooh wait different political battle). With guns made illegal will more people be at risk for their lives? Are those locations with less strict gun laws actually safer than those with? Will a normalization of guns make America safer? I set out to find some sort of answers to these questions. Like I stated above, I have no interest in guns and likely will never buy one, but the ultimate desire for me is a safer place where people are not unnecessarily killed. I intend to find as many neutral sources as I can, ignoring those who are explicitly pro- or anti-gun or notoriously left- or right-minded. I understand that statistics are malleable (how does the saying go? 85% of statistics are wrong?) but I would suppose that these numbers will lead us into the truth rather than personal anecdotes which may be more affecting, but less helpful. This article goes through various statistics, looking at the amount of times guns were used in self-defense in order to prevent a crime from happening. The numbers vary everywhere from there being 2 million cases of fire arms used as self-defense (by a Florida State criminologist) all the way down to 100,000 by the National Crime Victimization Survey. Overall it seems as if guns do protect a significant number of people. According to JustFacts – in 2010 40-45% of households owned a gun. Their study also says that of all homicides “67% were committed with firearms” (totals to 10,886), and adds that guns were used in 436,000 violent crimes. 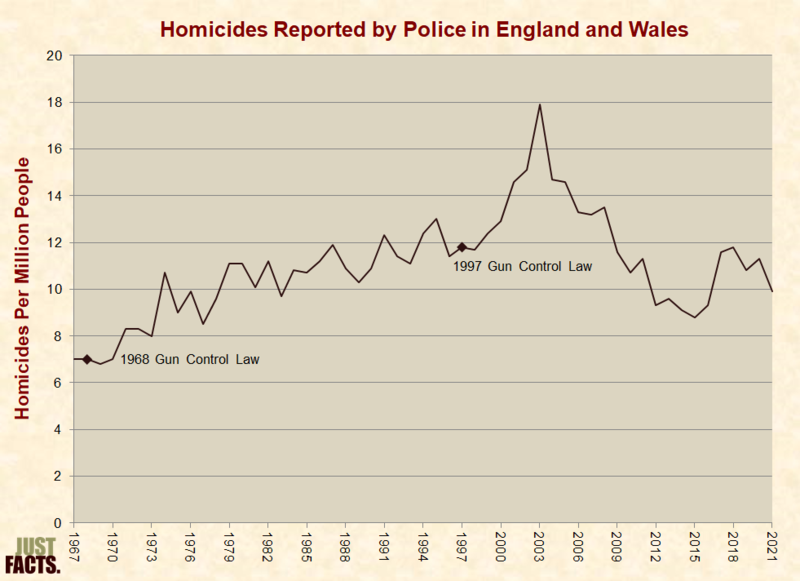 The charts used in the various studies seem to show some increase in crimes committed with the banning of handguns, but also seem fairly erratic. In fact, all seem to see a rise in homicides at some point, but also a decrease as well. 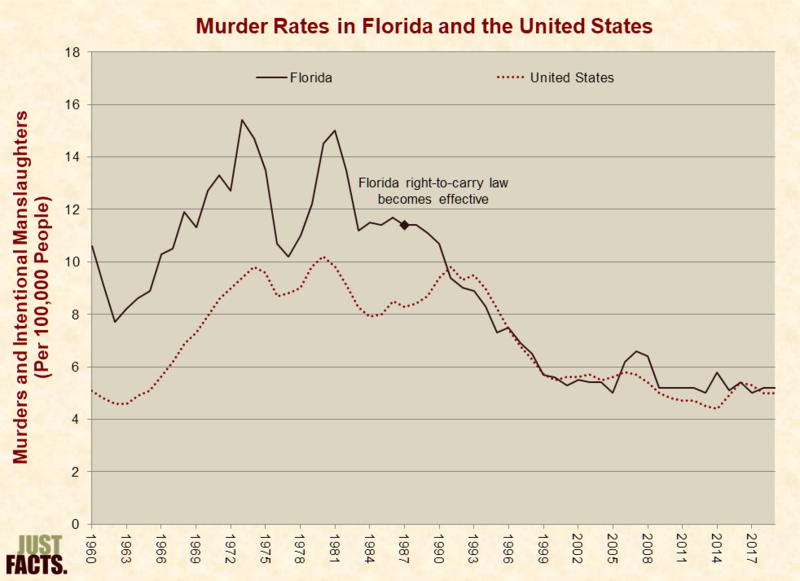 The Florida right to carry law seems to have lowered the amount of murders since it has been passed, lowering 21% than the US average. 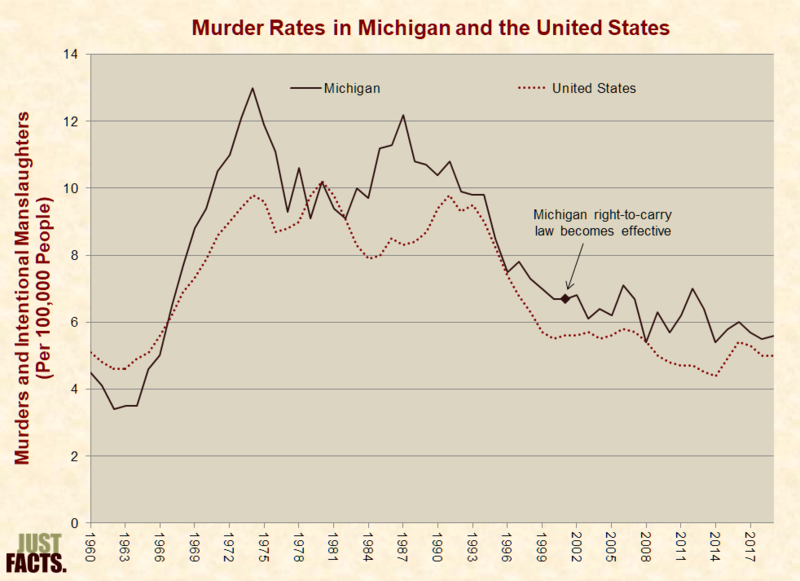 Michigan’s homicide rate has lowered since passing a right to carry law, but less than the national average. According to this study the number of total homicides have fallen in the last 20 years (page 2). 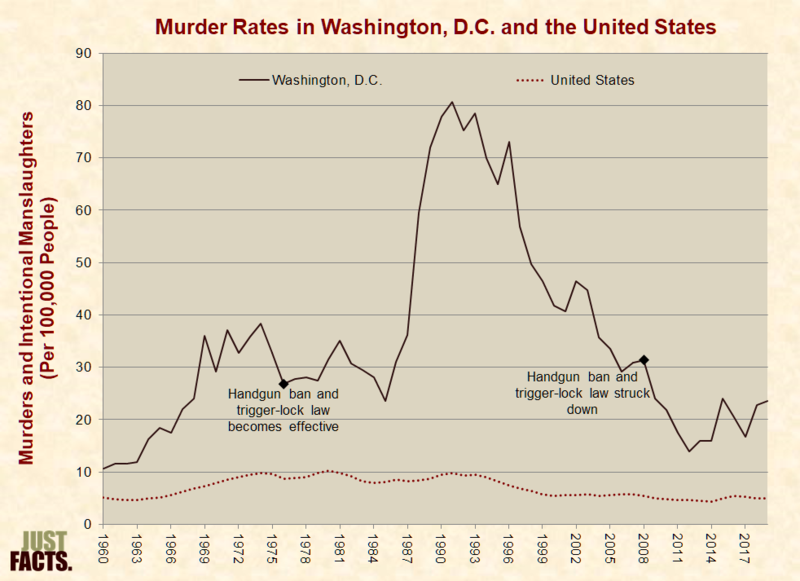 Factcheck.org has this graphic which shows that firearm homicide rates have decreased, just as firearm ownership has increased (though nonfatal injuries have increased). With this, economist John Lott argues that looser policies lead to safer places, but his work was refuted by 16 out of 17 researchers with the National Research Council who say there is not enough evidence to claim correlation. More guns seems to, naturally, lead to more gun violence, but as mentioned above there is not enough evidence to prove this either. These studies do not seem to provide enough evidence to conclude one way or another and no scientific research can be done, because it is implausible to do case studies. So it seems that even evidence swinging one way or another will lead to inconclusive data, because each scenario is far more complex than the numbers on the page – these numbers we have looked at also seemingly ignoring many cultural and economic factors that would play a part. Overall there does not seem to be clear cut evidence in any direction. 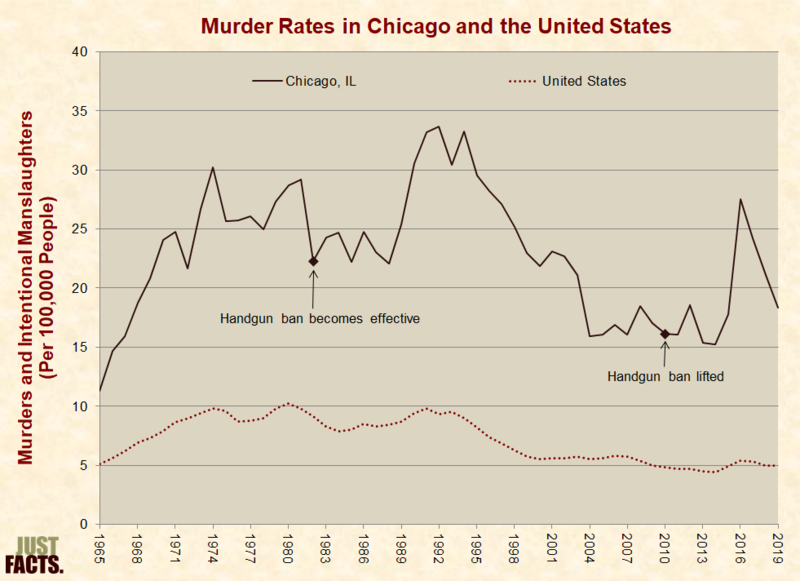 It is true that murder numbers have been dropping quite a bit across the country. 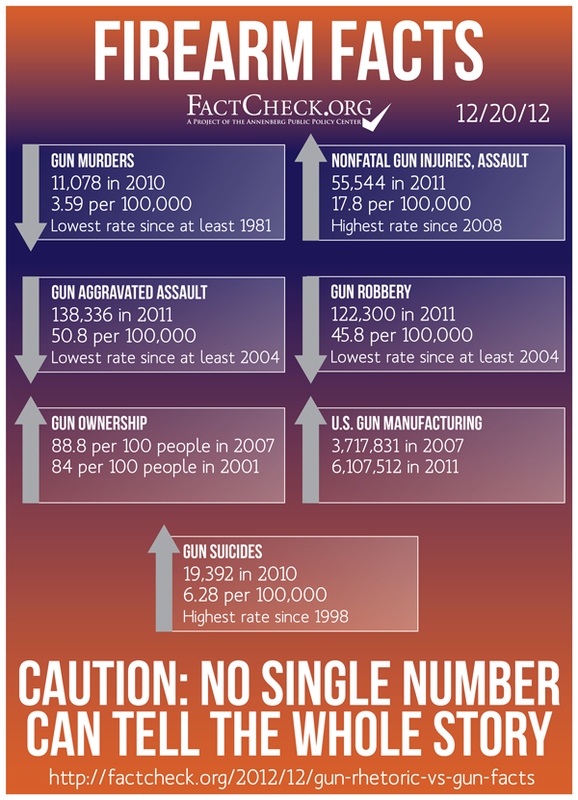 It is true that gun ownership seems to be on the rise. It is true that hundreds of thousands of people use guns as self-defense to prevent crimes (though it is hard to grasp exactly where this number lands). There is evidence that mass shootings are occurring at a higher frequency than in year’s past, but not exponentially as some have stated. There is mixed evidence as to whether high gun violence rates is a result of high or low gun control laws. Taking all of these into account it is hard to take a stance in any direction. There is some evidence for a rise in mass shootings and this should be dealt with. It seems like a rise in bipartisan research should be done to determine what seems to work best, stricter or looser laws. Most researchers seem to have concluded that they cannot really make any conclusions. More data could help to get a grasp on why this seems to keep happening. Is it too many or too few guns? Is it media glorification? Violent video games and movies? A rise in mental illness? The breakdown of familial values? A generally violent culture (there is evidence for this, which I may touch on later)? At this point it seems we don’t really know. So we turn to the answers that are easiest for us to believe. For me guns are violent and murderous life destroyers, but I’ve never seen one used to save me or my family. We must be careful of the narratives we take in, not accepting small quips and anecdotes from unproven sources. There is no evidence for an easy answer, so let’s not pretend like there is. Lastly, I understand the fear of a lack of being able to protect oneself. If evidence increased that the right to conceal saved more lives, I would be willing to accept the legislation. But when people point to solutions such as arming teachers with weapons, that scares me more than the world we currently live in. When arming oneself becomes necessary to go throughout daily life, then I begin to lament the state of the nation. Will we have monthly trainings instructing teachers how to fire weapons? Grocery clerks reaching for guns at the slightest movement of the customer? It sounds dystopian and is akin to a portrait of the Wild West, a sort of “my dad can beat up your dad” – only we all have guns. We were always taught that violence is not the answer, seemingly this idea has failed, but is the opposite the best approach?